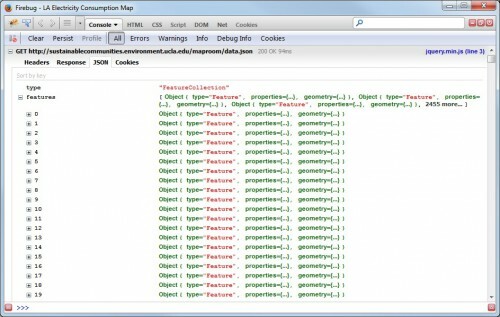 GeoJSON is a great data format for web maps for a number of reasons. There is low server overhead to storing and serving a flat .json file, and applications built off a static file are easily portable (you can even run them straight from your local drive while developing!). 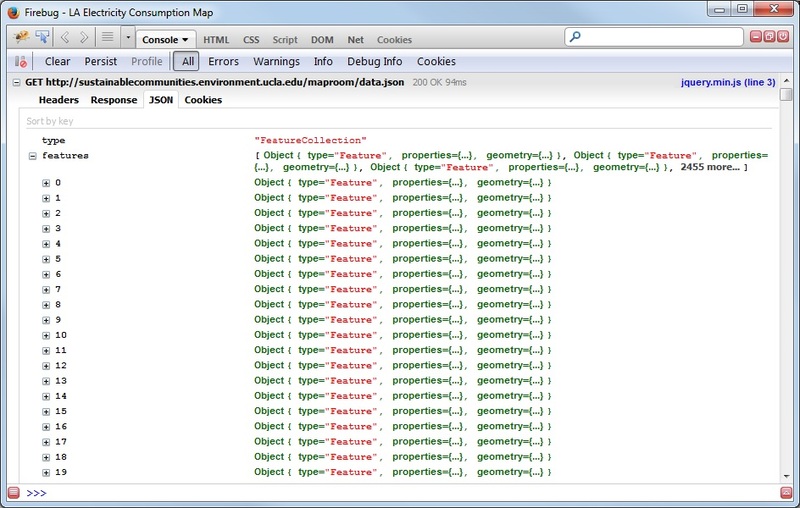 In this script, “data.json” is the name/path of the GeoJSON file that will have its coordinates trimmed. Simply replace this path with your own JSON file and open the HTML in an internet browser to display the trimmed version. It is important that both the server and client browser recognize a data file as JSON to ensure it is compressed and read efficiently. On the server side, if you are serving dynamic data from a database query, make sure to set the header “Content-type: application/json”. Client side using jQuery, make sure to set the dataType parameter of the AJAX request to “json” – otherwise the browser will request the data as uncompressed plain text. You can tell the data was loaded properly by checking the Firebug console – if correct you’ll see a JSON tab that allows you to browse the features in a structured format.